Michelle Campbell and Katy Rickards rent a house in Kensington, Melbourne, with their cocker spaniel, Ziggy. The creative couple work as a photographer (Katy), and copywriter (Michelle), and together own the in-home pet photography business, Dogfolk. It’s hard to imagine now, but when Michelle and Katy first moved into this home over four years ago, it was rundown and unloved. “Kensington has gone up in value since and is really quite sought-after now, but when we moved into this place it had been sitting empty for a month. That’s pretty unheard of now,” Michelle says. “We actually got a reduction on the rent because it was that bad,” Katy says. 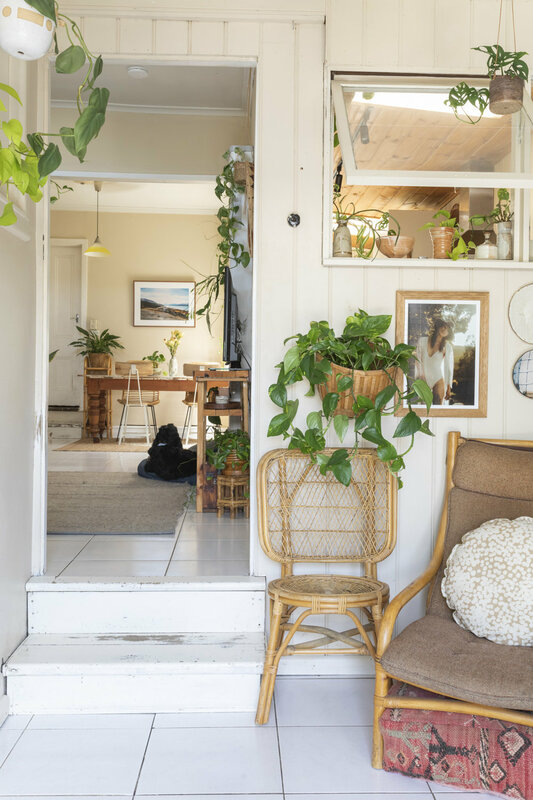 The addition of cosmetic updates, such as screwing several small hooks into the weatherboard walls to support indoor plants to grow across the kitchen, has made a huge difference to how the home appears today. Among these plants are two devil’s ivies, one of which was originally found neglected on the side of the road with just two burnt leaves, and the other that was Katy’s first ever plant purchase. “The thought of moving it actually gives me anxiety!” Katy says. There’s a lack of built-in storage in the home meaning most items are on display. 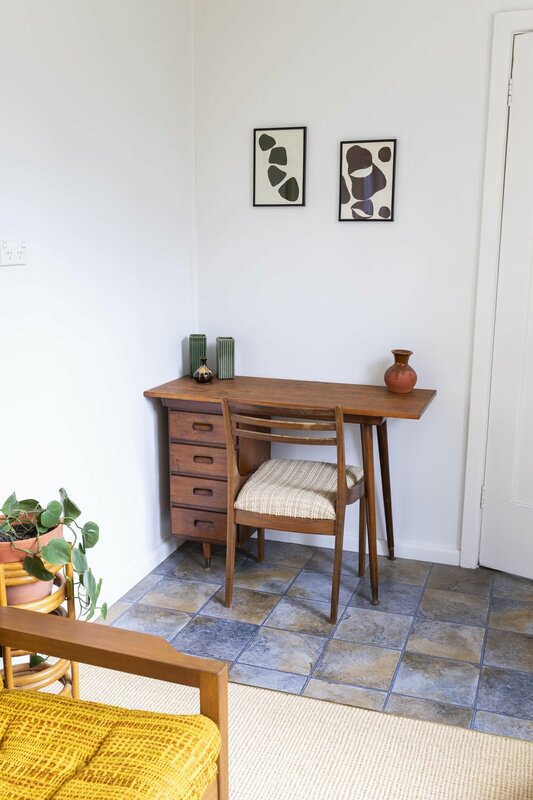 The furniture is an assortment of items bought from the Camberwell Sunday Market, Facebook selling groups, Ikea, garage sales and pieces found in hard rubbish. The kitchen looks out through windows to a sunroom that has been filled with plants. “I’m obsessed with scrapbooking, so I kind of feel like the walls are my own scrapbook pages,” Katy says. Katy is undoubtedly the home’s main stylist, but Michelle steps in on occasion, mainly to act as a practical voice of reason! They’ve recently started observing ‘three Ps’ – price, purpose, placement – in order to justify any new items brought into the home. “I’ve hardly had to lift a finger! Katy has put a lot of time into making our home what it is – I love all her thoughtful little touches. Although I did choose the matching pair of timber wall shelves that we drove all the way down from Byron when we had zero space in the car. I really had to convince Katy to get them, and in the end, they were the perfect fit for our space!” Michelle says. Home is of great importance to Michelle and Katy. 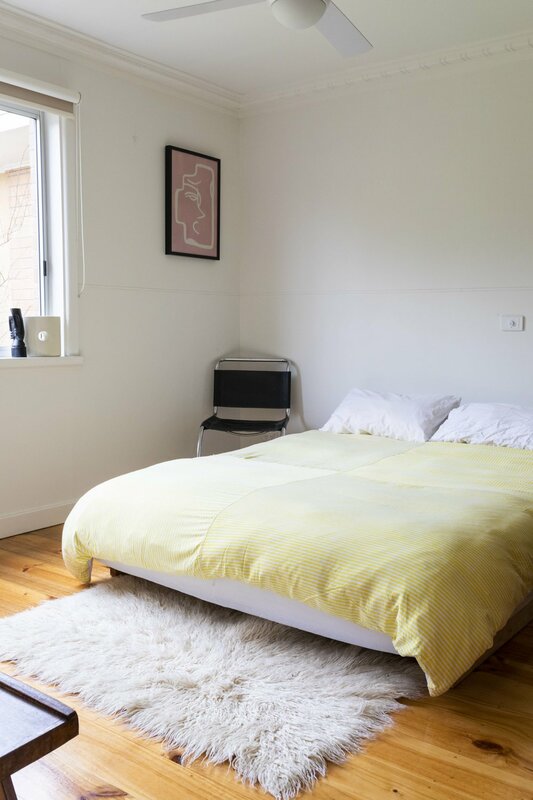 Not only do they spend most of their days here working from home, but this is also the first place the recently engaged couple have lived in alone after years in share houses across Melbourne and London. “We’re both creatives and work from home a lot of the time, so it’s super important to us to live in a space that helps fuel our creativity. It’s nice to just look around our home and feel inspired. Mostly though I’d say it's the homely, welcoming vibe of our space. There’s a lot of love in our house and I think you can really feel that,” Katy says. The couple still love walking around the neighbourhood and appreciating the area’s charm and varied houses (which remains somewhat of a novelty to Katy who’s originally from the UK). In the long term they imagine possibly moving buying property and establishing a life in Byron Bay. Katy: Allll the plants! And when you think you’ve got enough, get more. Plants instantly bring life and a beautiful energy to any space. We are super lucky that we are able to hang things on our walls, but if that wasn’t the case, photographs and Washi Tape would be essential household items. Michelle: Double-sided tape to keep floor rugs in place! What are your most frequently searched home-related terms online? Katy: Half the tabs on my internet browser are for ‘op-shops near me.’ Regardless of where we are, I always try to get a sneaky look in. For individual items, I feel like I have a new obsession each week. Last week was vintage wall hangers, this week it’s vintage baskets. ‘Plants for sale’ for would probably be my constant though. What are your favourite furniture and homewares stores? Katy: Ohh tough one! I’m pretty loyal to Savers but I love all op-shops. When it’s your time to find a little magic, any which one can deliver at any time. I did discover Hunted Antiques in Kilsyth the other week; the sheer scale of the place and its collection of vintage wares was incredible, you need the best part of the day (and all the coffee) to fully explore it. There are just so many beautiful little shops and markets to explore in Melbourne, I think I just love them all equally! What’s the best thing about renting? Katy: For us, probably the ability to live in Kensington at this stage in our life. House prices are so high that there’s no way we could buy here. We are in love with this area and our home, so we’re incredibly grateful for renting. Michelle: We’re the kind of people who love our freedom and don’t like to feel too tied down, so even though we absolutely love Kensington and our home, it’s nice to know if we were ready for a change, we could move on without too much fuss. But I don’t think that will be happening any time soon. Erin Champion and Jai McTaggart rent a house with their cat Coco in the coastal town of Barwon Heads, Victoria. This rental has only recently become the couple’s home since making the sea change from Melbourne earlier this year. Together, they own Dust Vintage Spaces – a styling and furniture business sourcing retro pieces. Erin is also a jewellery designer for her label Erin Champion Jewellery, and Jai works as a yacht technician. The couple talked about moving from Melbourne for a long time before Erin finally made the call this year. While they are still in the city frequently for work (Jai catches the train into Melbourne every weekday), this new home base has encouraged a slower pace of life. The main living spaces in this rental have recently been renovated but retain plenty of charm throughout. The sunroom in particular is a standout, having been quickly filled with various indoor plants. 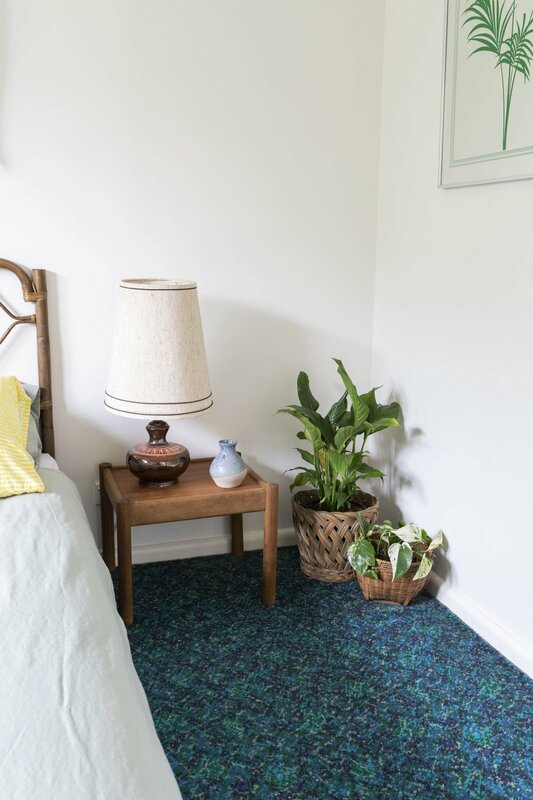 In addition to the main house, there’s also a garage, a huge backyard and a separate bungalow complete with an original ‘50s bathroom they plan to rent out as a short-term holiday house. The only ‘new’ items in the home are some picture frames, works by up and coming artists and Erin’s sister, decorative ceramics by Sushi Ceramics (that double as jewellery displays when Erin sells at markets), and a friend’s handmade throw rug. 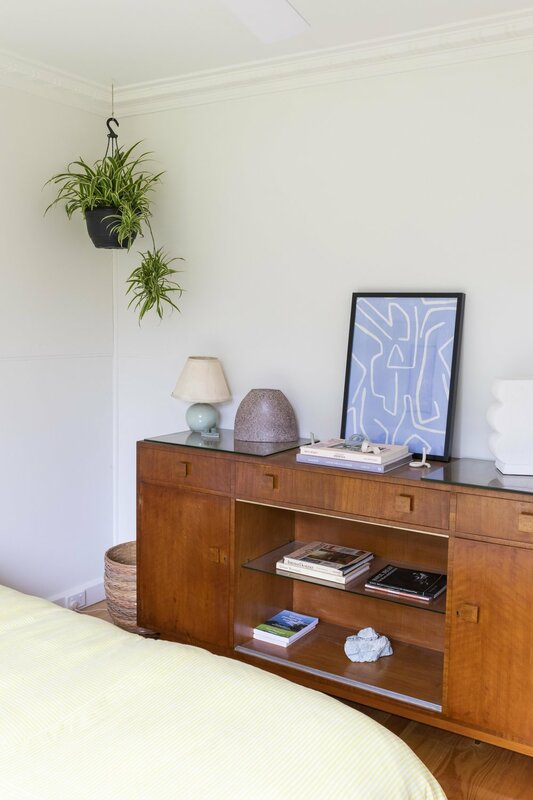 Most of the pieces sourced for Dust Vintage Spaces are stored in Erin and Jai’s house before being sold, meaning the styling of their home is constantly changing. The Persian rugs and orange pod lounges in the living room for example are among recent business purchases that look right at home in their space. All items for Dust are personally sourced from around the country at garage sales, bazaars, Gumtree and deceased estate sales. The couple tend to steer clear of mid-century pieces that dominate most online sellers’ pages in favour of late ‘70s and ‘80s items. The first big trip they made was to Adelaide, which resulted in finding several original ‘80s chrome pieces made in South Australia. Right now, Erin is on the hunt for some early items from Ikea. Erin and Jai’s long term plans aren’t set in stone, but living this rental is serving as a ‘trial period’ of sorts before possibly buying a property in the area. “We’re in two minds – we want to be near the ocean but also want a bit of acreage, and we really want a pet pig!” Erin says. Choose affordable, timeless pieces that will work in homes from many eras. You never know where you'll end up next. 80s, Italian and lounge suites. What are favourite furniture and homewares stores? Coming Soon, Smith Street Bazaar, Home Union, Pop and Scott and Vamp Vintage Design. Oh, and we never leave a plant store without a new member to the family! We seem to gravitate towards older homes built from the 40s to the 70s – they are always rich with personality from previous owners. Our current home has the most amazing, curated yard that we have dubbed the Barwon Heads botanical garden. Not to mention it’s a five-minute walk to the beach!